More than two decades ago I was a befuddled but beautiful Psych major at Arizona State University. I had long hair and a 31" waist. I was riddled with insecurities, however, about my future (which is, of course, just like today), and I was in receipt of another college transcript showing a wide variety of shades, nuances, and colors, but hardly any A's or B's. I was searching for a reason to get out of school, or maybe a reason to stay in. I did poorly in the Psych classes I finished, but I wasn't finishing too many of them. I had found my way into a ton of other classes, however: Philosophy, Mass Com, Sociology, and a few classes in writing (everything from freshman comp to introductions to poetry and fiction). I walked across campus to the Language and Literature building, an 8 story behemoth that housed classrooms and several Humanities departments, and took the elevator up to English. I supplicated myself in front of the departmental secretaries and told them a version of the tale that brought me to my knees. "I need to change my major," I said. "Can I get a degree in English?" The three secretaries came to the front desk and took turns tilting their heads at me, then shaking them sadly. I may be wrong, but I think one of them reached across and patted my hand. "It's too late," one of them said. "You're a junior. Tough it out." "Have you started taking your required courses yet?" another said. I proffered my transcripts, which showed a variety of courses, low level writing courses, nothing meaty. "I think you better see someone," one of them said. "Give him to Rita," one of them said. They pointed and I began my middlepassage down the hallway to an open door. Before Rita Dove could say much more than hello, I collapsed into a chair in her office and began sawing the mad, deep cello of my heart. Except for the occasional squeak of the chair, my robust and romantic woeful story washed us both. I thought I might weep. Surely this young, beautiful woman would see the pain, the misery, and she would weep, too. I waited. "I don't know how to do it," she said. "But I'll get some forms." And she disappeared. An hour later or so I walked out of the Language and Literature building into blinding sunshine. (This is not metaphorical at all; it was always blinding sunshine in those halcyon Tempe days.) I was an English major. I had the forms. Rita had solved it all. She gave me a schedule for the coming semesters. She asked if I was going to be all right, and sent me along the way I had come. 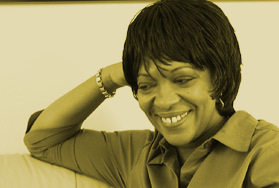 Rita Dove lives in a spectacular and quiet neighborhood outside Charlottesville. In the directions to her house are these words: field, meadow, Ivy, pond, lane, hills, and rolling. I stand outside the house and look down at this little body of water behind their house. It's partially covered with ice, but the sun is beaming down on it, shining up mad shards, erratic ribbons of light. Rita and her husband, the writer Fred Viebahn, greet me and we try to remember the details of the last time we met, two decades ago. Fred was moving a box of books out of or into Rita's office. He thinks that's right. He and Rita would have just moved to Arizona; he was likely helping her get her office set up. Fred goes off to his study and Rita and I sit in the living room on large white couches. There's a piano in the corner. An acoustic guitar casual up against the wall behind an occasional chair. Rita looks exactly like she did 22 years ago. She smiles at some of the memories I recall at the beginning of our chat. I'm trying to give her a sense of how important that one hour of February 1982 was, without making too much of a fool of myself. My life changed that day. I gave away the obligation to do something for others and took the charge of doing something for myself. I chased a dream that was my own, a dream (reading and writing?) without obvious and sensible rewards. And the past 2 decades are only possible because I made that walk on that one day. But we leave that behind. Rita is glad to hear it, but we move on to the interview. It's good to note, I think, that Rita Dove is a brilliant poet, one of extraordinary grace. Her books are rich, textured, funny, beautiful, honest, fearless, enlightening, and - always - sharply wrought. Her poems swirl into life and then explode into clarity with one final line, one last stanza. Sometimes just the right word. She is one of the most admired and honored poets of her generation, a Pulitzer Prize winner, a Poet Laureate. She has collected awards and achievements of a remarkable range. But one thing she tells me today obscures all the rest: She and Fred are ballroom dancers. She talks about a wild notion that drove them and their neighbors into some lessons. She and Fred were the only ones who stuck it out, and now they dance in the style of the "American Smooth," a somewhat loose interpretaion of the sometimes arcane and rigid rules of classical ballroom dancing. The foxtrot. The waltz. Samba. They have outfits. I've seen photos. Fred with his flowing gold mane in a tuxedo, Rita in a spangly purple number. We finish our chat about the suddenly mundane matters of poetry and place and then go outside for some photos. Fred joins us as does my wife and we stand in a loose formation overlooking the pond. What I want to say is, "Fred, I want to see you dance. Give Rita a twirl, would you?" I have such envy over this that I'm getting the kind of crazy thoughts I'm usually able to keep at bay. Maybe after the trip is over, my wife and I should start some lessons. I like the sound of that. Twirl. I want a tux like Fred's got. I want what Fred and Rita have. Not the house. Not the pond. I want to dance the American Smooth.